The 3 in 1 twist and zest tool from Microplane features a removable reamer that exposes a zesting blade that is made in the United States. This awesome tool has a channel knife with a protective cover for medium twists for garnishing. The twist and zest tool has a soft grip handle that provides and safe and comfortable grip. 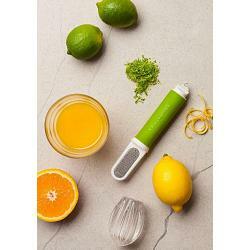 The tool is dishwasher safe and is perfect for baking with citrus fruits.